Today I wanted to give a bit of an update on my pregnancy. I am 31 weeks and 3 days pregnant as I write this. Last week, I saw my perinatologist. We’ve been talking about the vaginal pain that I’ve been experiencing now for weeks. Every other visit, we check my cervical length to make sure that I don’t have a short cervix. This time, I was worried things had changed. Not only am I getting a lot of vaginal pain, I am getting pressure with the Braxton Hicks contractions that I get. I wanted to make sure we were on top of things. Luckily, all is on track. My cervix has shortened since the last time we checked, but it is normal to have done so. Next up were bile acid levels. I’ve been itchy since pretty much day 1, and as a result they’ve been monitoring me for cholestasis (something I am high risk for since I had it with my first pregnancy). My hands are itchy, my feet are itchy, and my belly is itchy. It’s always inconsistent, however. Since cholestasis usually doesn’t show up in lab work until after 30 weeks, we’d waited to check. Well, this time my symptoms aren’t inconsistent. I’m itchy all the time. So, we ran the tests. My bile acid results came back at 20.4. This officially gives me a diagnosis of cholestasis. With this diagnosis, we will be inducing no later than 37 weeks. Cholestasis has a huge risk of stillbirth. I am counting kicks- and luckily William is super active. I am to feel a minimum of 10 movements in 2 hours. I check this twice a day. If I don’t feel him move that much, we go in immediately. One perk of getting to see a specialist for all of my high risk craziness, is that I get ultrasounds all the time. 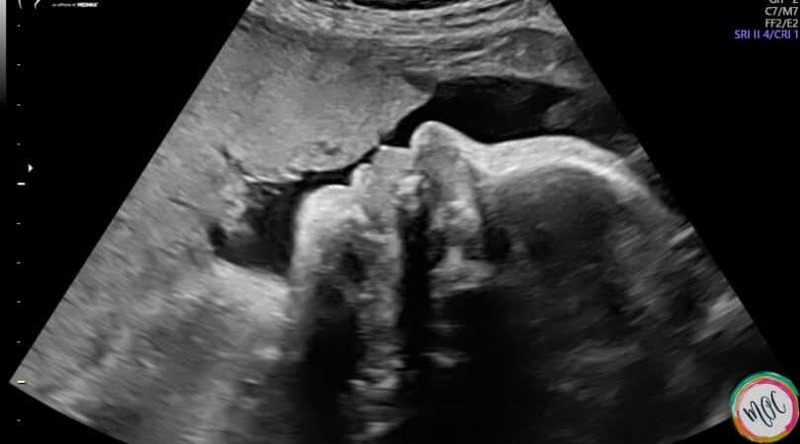 William looks FANTASTIC every ultrasound. I am going in every 2 weeks right now. As of last week, when I was 30 weeks along, William was measuring at 33 weeks and 2 days. His weight (according to the ultrasound)…and yes I know it can be unreliable…. was 4 lbs 15 oz. I’ve been checked for gestational diabetes. All looked good. I have also had minimal weight gain. As a result, my doctor is thrilled to see him measuring so far ahead- especially with an early arrival on the books. Caroline was 7 lbs 6 oz at 37 weeks, so had she not been induced, she’d have been pretty big as well. I am always so pleased with his progress. He easily tells me that he is doing alright in my belly and gives me little worries. This official cholestasis diagnosis on the other hand, does have me worried. 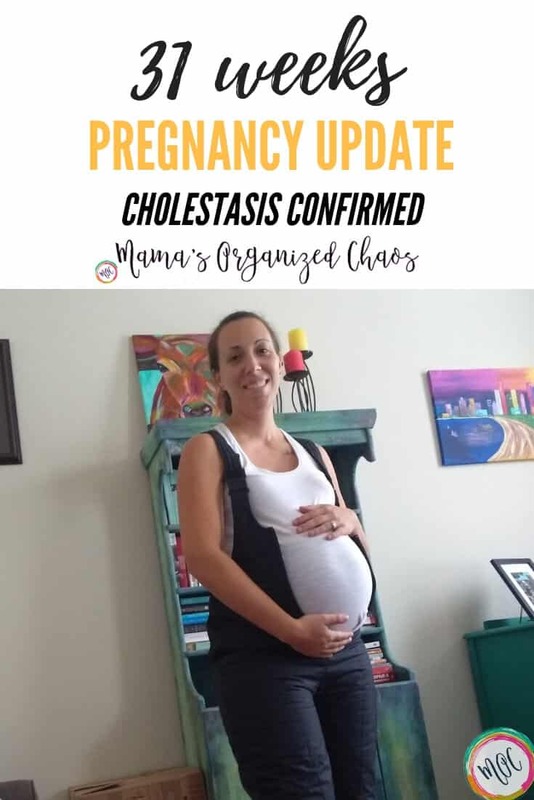 I knew I had cholestasis. It was obvious to me. But it wasn’t until I heard the words spoken, and the official diagnosis was given, that I really got concerned. I can’t fathom another loss. And so we are just going day by day, thinking positive thoughts. Caroline is scared. She’s scared for William, and she’s scared of me at times. She doesn’t understand. She thinks that me having cholestasis, can somehow hurt me…or even her. She’s nervous to hug me. It’s all so sad. We just keep talking with her. Please send positive thoughts our way. We need baby William to be healthy and strong for 6 more weeks. 6 more weeks, and we’ll have him in our arms.